Arguably London’s hippest market, this Hackney stalwart is a weekend destination for fresh produce, vintage clothes and delicious street food. Broadway Market continues to thrive following its clever makeover nearly 15 years ago. This compact Hackney street, which neatly connects London Fields to the Regent’s Canal, has had a traditional fruit and veg market since the 1890s. But it went into steep decline in the ‘80s, and trade had all but petered out before the community relaunched it in 2004. 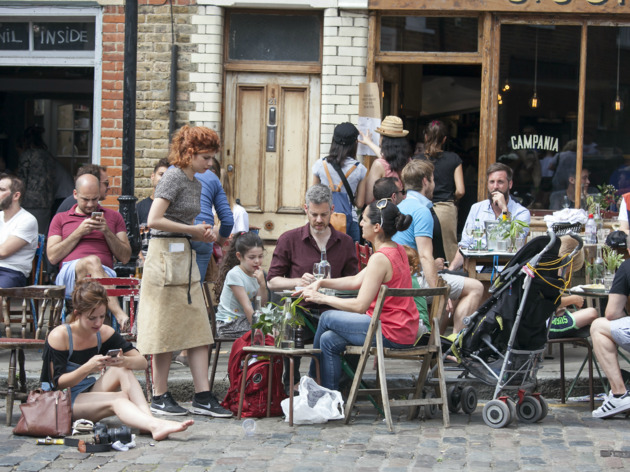 Now taking place on Saturday from 9am-5pm, Broadway Market is a bustling hub for the Hackney hipsters and East End creatives who have settled down and started families. It now welcomes around 135 stalls selling a fabulous array of fresh produce, vintage clothes, flowers, coffee, books and groceries. There’s also plenty of delectable street food, including Deeney’s toasted sandwiches, Fin and Founder’s crab-cake burgers, Floris Bakery’s chocolate eclairs and the modern cult classic Yorkshire Burrito. Although there are no stalls during the week, Broadway Market is still worth visiting for its cute coffee shops, one-off restaurants and chic boutiques. Gentrification has more than crept in, but it still feels like a local high street complete with a kebab shop, post office, Costcutter, old-school barber shop and excellent hardware store. Even outside market day, you’ll find it buzzing with people pottering about, nattering over coffee and doing their weekly shop. Check out the video below for our full guide to Broadway Market's best eats. As far as the food markets go, this one is my favourite. Always a solid selection of food to choose from, I love there are always few stalls you can always count on to be there. Coming here on a Saturday always puts me in a good mood. Try the prawn burger, buy yourself nice bottle of extra virgin olive oil and fresh cherry tomatoes. Don’t forget vegan cheese and spreads from Nut Ok. You’re welcome. Broadway market is a must in East London if searching for some street food in the area. Running every saturday it is conveniently a short stroll from nearby Cambridge Heath and Bethnal Green stations alongside the regents canal and connects nicely with London Fields at the end. There are a vast array of different stalls and selection of food stands to choose from including Frenchie which do legendary duck confit burgers, Zardosht that offers great persian stews and kookoo wraps and brightly coloured pretty meringues from The Meringue Girls. There are plenty of cafes and restaurants that exist alongside the market too. Recommend to bring cash as a lot of stalls won’t accept card here. Every Saturday, the Broadway Market is wide open to welcome all the hungry East londoners. Plenty of food choices under reasonable prices - food either to eat or buy as your weekly groceries. Choose one of the several brunch spots for your Saturday brunch & coffee, and then stroll all the way down to the canal enjoying this lovely market! Love this market! Check out my video in the description! Yes, yes, YES YES YES. Have you been to Broadway Market yet? If you answered no, then you really need to change that. If you eat food (i.e. are alive and breathing) then Broadway Market has something to offer you. It is everything about East London that we love - good food, at good prices, sold by honest tradespeople in a really cool part of London. Plus, once you're done, grab some tinnies from the Offy and take up residency in London Fields - the PERFECT Sunday! Broadway Market, for me, encapsulates everything that is amazing about the East End. It’s hip, happening, quant, edgy, indie and more. Quaint cafes, historic looking pubs, indie and boutique stores line the street, while the farmers market itself is brimming with vendors selling all sort from fresh, artisanal produce to mouth-watering street food. If you want my recommendation, try the Chicken Katsu wrap. For a fiver, you’re getting an awesome wrap with all the greens for your five a day and that gorgeous crispy chicken we all know dressed in an assortment of sauces of your choice, and all in a warm wrap. That’s not all, the small but mighty Netil Market is just around the corner if you still have the energy left to explore another market in town. It has a similar vibe to nearby Columbia flower market (without that many flowers, obvs) but it’s not as busy because the road is much wider so you can wander around freely without feeling like you’re on the tube. Even if you’re not here for the food or looking to decorate your home with unique ornaments, then that’s ok - Broadway Market is just as much about letting your hair down and soaking up the vibes on your day off. One of the top things to do in London on a Saturday, Broadway Market is an award-winning London attraction and rightly for being sooo London. As my local market, it's too easy to take it for granted but it really is pretty special. There's great food on offer both on the stalls and surrounding shops, but also such variety of other goods too, with oodles of East End quirky charm to boot. It has expanded over recent years and there's also more often than not performances of some description going on down the street Ther are also plenty of great pubs, bars, restaurants not to mention coffee shops on the street too, and also in the summer London fields for BBQs chilling in the sun and the Lido. What more could you want from a market?! A really lovely market. The food is AMAZING, even tried my first tofu dish, which was a success...YAY! It's great to support the local businesses. The perfect place to visit for a trendy afternoon out in East London. Brilliant street market with a great selection of food, vintage and craft stalls. The market also benefits from the street itself have great coffee shops, restaurants and stores alongside it. Would recommend getting food and walking to the top of the street to eat it in London Fields for the proper hipster experience! If you had to describe Broadway Market in one word, I think that word would have to be "Nom". Every Saturday, this Hackney outpost becomes a foodie's heaven. There are so many delicious foods and stalls to choose from (with lots of good veggie options too - the large fried tofu wraps from Katsu Wraps are particularly delicious and good value). Make a day of it and visit the nearby London Fields Brewery afterwards. Love hanging out in Broadway Market area - especially when the days are getting sunnier and warmer! It's definitely one of my favourite places as you don't feel in Central London. It's more like being in a village with an East London Touch we all love. My ideal afternoon would be - #1 walking along the canal from Angel - #2 Searching for a gem in one of the bookshops and unique designers, art and crafts stalls - #3 Grabbing something freshly cooked from the food market, a bottle of wine, and simply enjoy a lovely afternoon with friends in London Field. Say you've been on one or two successful Tinder dates (drinks, duh) and now you need to be more creative with your next date. Go to Broadway Market. There is so much to eat and entertain yourself with that even if you don't like your date now that you've seen them earlier in the day (and sober?) you will have enough distractions to balance it all out. In all seriousness though, this place is a true London gem. Although tourists have started to catch wind of it, as opposed to Borough Market you can still avoid massive crowds here and there's a great selection of things to eat and people to watch. Avoid the mistake I always make of sitting down somewhere to eat and just eat a bunch of different foods and pastries at the stalls. Although the restaurants are also really good and you can have nice brunch, the magic is in the market. The scotch eggs will change your life and you can get a dope coffee at the Pavilion Bakery to keep you warm on the walk you take along the wonderful canal if your date goes well. A food lover's paradise. There's so much on offer that it was too hard to choose. So far I have had a bit of a hit and miss experience. Being a cinnamon fanatic I couldn't just walk by a basket of cinnamon buns and pretend they weren't there. Nyborg's cinnamon buns did not make me a happy bunny though. The bun was tough and put my jaws to the test. Might I add, the cinnamon level was on the low side. Dumpling Shack's infamous dumplings cost £7.50 for four pork and prawn dumplings is pretty steep. Add on the waiting time of 30 minutes and you know that things are getting serious. Imagine what is was like then to bite in to one of these dumplings, complete with a dashing of soy sauce and vinegar, and feel rather sad. There was no joy, no party in the mouth, no dazzling array of flavours - it just tasted like your average pork and prawn dumpling. It's not small enough to throw the whole thing in your mouth so the soup ended up at the bottom of the paper plate. While I welcomed the crispy base, the doughy and undercooked twisty top annoyed me. Worth the wait and price? Sadly, no. Those were the two misses - the hit was a beef rendang from Makatcha. While I was not keen on the long grain rice and choice of pulled beef it was still a cracking dish. The flavours were awesome. I practically inhaled the pickled vegetables and the peanut sauce was a welcome addition. Love the hustle and bustle of Broadway market. Great food as well! I recently moved from Hackney to Belsize Park and I can honestly say that I officially left my heart at Broadway market. So much so that I would happily wave goodbye to the plush greenery and ruddy cheeked children named things like Poppy and Orlando and return to my shoebox of a flat just for the sheer pleasure of waking up on a Saturday morning and wandering down to the market. It's all things to all people and great fun at any time of day. Hit it on a Saturday morning and you can pick up a steamy coffee from Climpsons and sons and pick up a delicious pastry as you wander amongst the vintage stalls and old bookshops that line the side of the pavements. Go down at lunch and you can fight your way through crowds of disgustingly good looking people to get a table at the infamous market cafe that is always heaving and always delicious. There's also an equally great tapas restaurant that does a pancake breakfast to die for and a franco manca for good measure. Or you could admit defeat and head back to one of the market stalls for a variety of food to rival borough market. Mushroom risotto, gigantic scotch eggs, curries, vegan burgers, iberico ham, pasta, crepes - you name it, it's there. There's some pretty great pubs too. The Cat and Mutton has sadly been refurbished and I do long for the days when your feet stuck to the floor and you were greeted with a scowl at the bar but perhaps that's just the nostalgia talking. Most other people agree that the food menu is much more varied, (it's often home to lots of pop ups) and that the interiors are as cosy and welcoming as the staff. If you're looking for late night boozing you could move from one of the many pubs to the underground whiskey bar Kansas Smitty's tucked underneath Off Broadway. See, it's got everything. Sure, the market only runs on a Saturday which is borderline inconvenient for my desire to stuff myself with as much street food as humanly possible but with all the other amenities you could still have just as great a time visiting this street any day of the week. The best street in London. End of. Just a shame its only open on a saturday!! Stall selection is on point. This whole area is gorgeous but the market in particular is really lovely on a Saturday and there's some really good street food. a great atmosphere and the street stalls are great. Plenty of places child friendly. Lovely destination on a market day. Offers adventure and creativity.. delissssh food too. 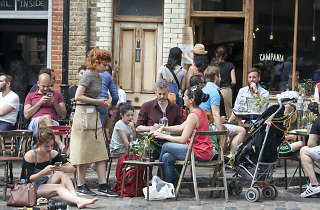 I headed down to Broadway Market for the first time on a Saturday last weekend and was blown away by how lively and full of activity the entire stretch was. I'm not usually one for arts and craft type stalls, but I couldn't help but stop by a few stalls, such as the leatherwork and the needlework ones. Of course, the food stalls were no slouch either, and I grabbed myself a tasty meringue from Meringue Girls (who are still one of the best sugar crafts[wo]men) after a fried chicken burger. I'll have to come back another day to experience everything the market has to offer! Amazing selection of innovative food offers, fantastic vibe! A brilliant little market between the Regent's Canal and London Fields for a Saturday stroll. You'll find everything from artisan produce and crafts, to retro clothing and homewares. The street itself is quaint, full of coffee shops and cafes, book shops and bakeries. It's a nice alternative from the overcrowded Borough market and still maintains that East End charm. Excellent market. Try the bratwurst stall at lunch for an echte bratwurst experience. Broadway Market is meant to be the foodie's paradise, so I was delighted to learn that the new flat I moved into, is only a 11 minute walk away! Now, don't get me wrong, it was good. Maybe I just built it up too much in my own head. Maybe I should've gone earlier, like the crack of dawn? Maybe I shouldn't have stalked their instagram, because as great as Instagram is, we all know it's a lie and food never looks like it does in the photos. Long story short, the food we had was good - haggis scotch egg. The walk was delightful, if a bit short. And I will be visiting again, albeit a bit early (and also cause I live nearby). I saw on Instagram a scallop and bacon butte, and I want to go to there. So I will. I will track this scallop and bacon butte down until it's the last thing I do. Broadway Market seems to be one of those places you'd point out as London, the same way a hipster uses a typewriter. It's a place to escape the reality of the contemporary hyper-commercialised high streets and mind-numbing maze of Westfields. Not that there's anything wrong with either. There are some genuinely good food, fresh bread, cheese, meats, and coffee. It's certainly not as crowded as Borough Market, which leans towards catering a more populous taste. Here the yuppies are king (or queen), free to soak in the rustic-chic of the good old days without any of the bygone inconveniences, for a pretty penny. Unfortunately we are still unable to avoid rainy day, which parts the crowd into the various craft beer establishments lining both sides. Expect to see, a banjo, tiny dogs, oversized moustaches, and massive crowds on a sunny day.